Hon. Mark Brantley, Premier of Nevis presenting the Top Constable 2018 Award and plaque to Constable Carl Gordon of the Criminal Investigation Department at the Royal St. Christopher and Nevis Police Force (Nevis Division) Constable’s Awards Ceremony and Dinner. CHARLESTOWN, Nevis — An officer at the Criminal Investigation Department No. 653 Constable Carl Gordon, is the Constable of the Year for 2018 on Nevis. He emerged winner from a field of eight awardees at the Royal St. Christopher and Nevis Police Force (RSCNPF) (Nevis Division) Constable’s Awards Ceremony and Dinner. It was hosted by the Strategic Planning Group on Feb. 23. 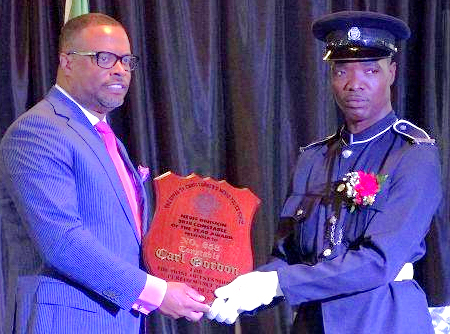 The Top Constable who also received the Premier’s Award, was presented at the ceremony with a plaque, a Certificate of Excellence and a television by Hon. Mark Brantley Premier of Nevis. In response, Constable Gordon noted that the top prize was not only about him. Gordon referred to the ceremony as an auspicious occasion, one which he will remember as being among the fondest in his life on Nevis. The officer used the opportunity to urge his fellow constables to give of their best because the community and the country deserve it. He registered gratitude to everyone for their support and for the recognition he received. The first runner up was No. 677 Constable Trevin Mills of the Violent Crimes Unit. He was presented with a Certificate of Excellence and a television. Constable Mills also won the Commissioner’s Award. The third runner up was No. 735 Constable Lowell Wallace of the Task Force Unit. He was presented with a Certificate of Excellence and a television. Constable Wallace also won the Divisional Commander’s Award. The remaining awardees were No. 769 Constable Glenville Nisbett. He won the Chairman of the Strategic Planning Group Award; No. 642 Woman Constable Cherilyn Matthew-Best of the Gingerland Police Station; No.859 Constable Maxim Isaiah of the Newcastle Police Station; No. 884 Constable Bisette Bentley of the Traffic Department; and No. 934 Constable Kareem Romney of the Beat and Patrol Department. During the ceremony, all the awardees were presented with Certificates of Performance by Her Honour Hyleeta Liburd, Deputy Governor General on Nevis. The Royal St. Christopher and Nevis Police Force Strategic Planning Group was formed in 2002. Its mandate was to review operation methods and to devise strategies to fight crime on Nevis.